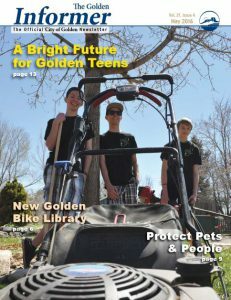 The following article appeared in the May issue of The Golden Informer. An upcoming lecture at Golden History Museums will explore a dark chapter in the city’s history. Program attendees will hear the story of the Ku Klux Klan’s existence in Golden, their large membership, and the intimidation tactics they used on people. In the 1920s the Ku Klux Klan regularly held meetings on South Table Mountain, their burning crosses visible from Washington Avenue. A road leading to the top of South Table Mountain was established in 1908 and was used by the KKK for their weekly rallies near Castle Rock, which the Klan referred to as “Kastle Rock.” Cars filled with Klan members drove from Denver down Colfax Avenue and would pass the Jewish enclave called “Little Israel” between Sheridan and Wadsworth. Since most Klansmen hated Jews, the drivers would intimidate the residents by honking their horns as they drove through this area. During meetings, KKK guards were posted at the bottom of the road leading to the top of South Table Mountain. Their guards would check membership cards to keep “undesirables” from attending their secret meetings. Up to 10,000 KKK members attended these rallies which were usually conducted on Monday nights. Dr. Galen Locke, the Grand Dragon of Colorado and leader of the Klan in the state, was often the featured speaker. At these rallies, new members would be initiated or “naturalized” and the group would sing patriotic songs. It has been estimated that a staggering 10% of Colorado’s male population were card-carrying Klan members in the 1920s. Members of the Klan believed they were joining a fraternal organization aimed at restoring Protestant Christian values. They believed these values were under attack from immigrants to the United States, particularly Catholics and Jews. They also believed that African Americans, who were moving to Colorado trying to escape discrimination in the South, were “outsiders.” They believed these “outsiders” were attacking their values, stealing jobs, and should not be hired by white business owners. This message resonated because of labor unrest and an economic downturn in Colorado, problems the Klan promised to fix. Recruiters started building Klan membership in Colorado as well as the rest of the country. 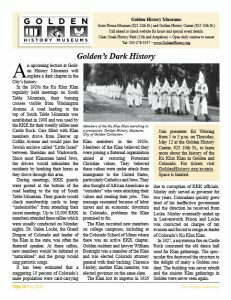 The Klan recruited new members on college campuses, including at the Colorado School of Mines where there was an active KKK chapter. Golden resident and lawyer William Boatright was a member of the Klan and was elected Colorado attorney general with their backing. Clarence Morley, another Klan member, was elected governor on the same slate. The Klan lost its impetus in 1926 due to corruption of KKK officials. Morley only served as governor for two years. Coloradans quickly grew tired of his ineffective government and the direction he received from Locke. Morley eventually ended up in Leavenworth Prison and Locke was convicted on charges of tax evasion and forced to resign as leader of Colorado’s Ku Klux Klan. The dance hall on top of South Table Mountain was known for hosting Paul Whiteman’s famous band. George Morrison, a black band leader, would play down the mountain at the Rock Rest. Morrison gave the iconic Hattie McDaniel her big break. Ironic that the Rock Rest is still standing!